Police continue probe of bus crash on Route 443 that left two haredi women dead, 41 other people injured. The victims of Sunday morning’s fatal bus crash northwest of Jerusalem have been identified as Rachel Chaya Guttman, and Ruchama Rosen. e bus driver from the Kavim company who was involved in the fatal crash Sunday morning which left two women dead and 41 people injured is expected to be questioned under caution by police for his role in the accident, in what could be the precursor to a criminal investigation into his conduct. 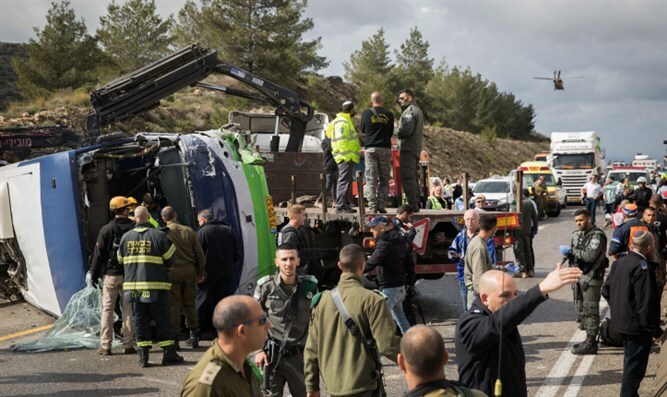 Police continue to gather evidence from the scene of the accident, which occurred near the Israeli town of Beit Horon in southwestern Samaria. At 9:15 Sunday morning, a bus from Kavim’s 304 line, which links the haredi city of Modiin Illit to Jerusalem, crashed as it travelled towards the capital down Route 443. Two women, who have been identified as sisters from Modiin Illit, were killed. Forty-one others were injured, including two people in serious condition and five others said to be in moderate condition. Police reported earlier on Sunday that the accident took place following a smaller accident on Route 443.